Need Help? Call us on 0161 776 9832 or drop us an email for expert pest control advice on how to identify pest infestations and help solve your problem. Rats are various medium-sized, long-tailed rodents of the superfamily Muroidea. 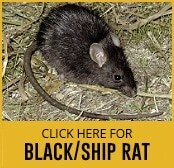 There are two main types of rats that are of concern in the UK: the Brown Rat and the Black Rat. Although people do not usually see the actual rats as they are particularly active at night, signs of their presence can be relatively easy to identify. How to Spot Signs of Rats? 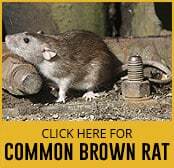 Rat Droppings – Brown rat droppings are usually rectangular with blunt ends and can be found in small groups, while black rat droppings, found scattered, are pointed sausage shaped. A rat can leave about 40 droppings per day. If the droppings are moist and dark, it is a sign that rats are in the area. Scratching Noises – Black rats, known as roof rats, are superb climbers that often invade the roofs, rafters and attics of structures. So, scratching noises from these sources after dusk may indicate their presence. Meanwhile, brown rats can be identified through grinding sounds or chattering noises as they scurry beneath decking and floorboards. Footprints, tail swipes and smears – Rats’ four-toed front and five-toed back footprints and tails marks are mostly easily seen on muddy or dusty locations. These tracks can be spotted by using a strong flashlight aiming at a low angle. Rats also leave smears -dark grey marks- on surfaces where they repeatedly rub their fur against. As smears may stay for a while, however, they are not a good sign of an active infestation. Running tracks – Rats tend to run along the same established routes many times a day, leaving dark greasy marks along walls, floorboards and worn down paths in grass and low vegetation. Burrows – Burrows are holes in dirt or concrete from one to four inches wide with smooth edges. Brown rats are good at excavating complex tunnel systems whose entrance holes (70-120mm in diameter) can be identified in grassy banks, under tree roots and at the edges of paving and drain cover surrounds. Nests – Black rat nests can be found indoors, in lofts, attics or under floorboards and in other dark, less used areas. Gnawing – Gnaw marks can be seen on materials such as electrical cables, pipework, wooden fixtures and plastic garbage cans. Rats usually leave large and rough teeth marks. Rats are some of the most troublesome and formidable rodents in the world – damaging and contaminating food, structures and properties, and human health. They can transmit serious diseases including bubonic plague, salmonella, rat-bite fever, leptospirosis, tapeworms etc. As a rat problem can be serious, it is important to minimize the level of infestation. 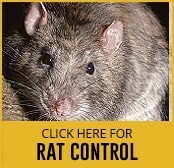 Unfortunately, rats are highly adaptable, secretive, mobile and prolific, which makes rat control a very difficult task for untrained individuals. If you discover signs of rats, therefore, it is best to contact our professional pest control expert because our pest control services offer discreet solutions to solve your rat problem quickly, effectively and at a very competitive price.